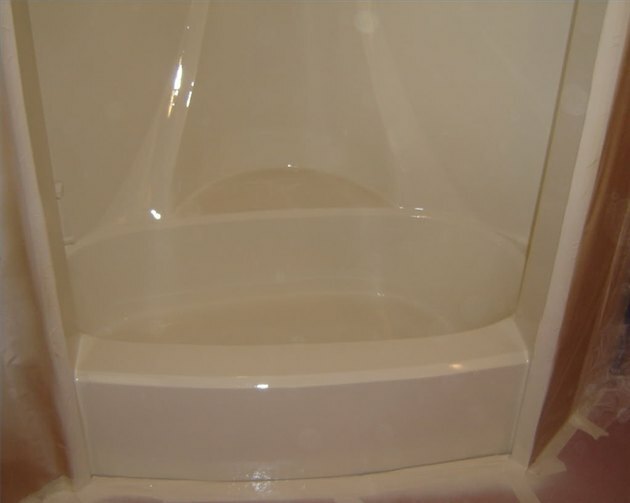 The finish of fiberglass tubs can dull and get surface scratches over time with constant use. The expense of a new tub is not always a viable option. There is an alternative that most homeowners can do themselves. Revitalize the shine and update the look of your bathroom with a little sanding and urethane paint. Bring old fiberglass tubs back to life with paint. Use a screwdriver to force out all old caulking material. Wipe these areas well with isopropyl alcohol to ensure all traces of silicone caulk are gone. Paint will not adhere to caulk. Clean the surface of the tub with a mixture of ¼-cup washing soda and a gallon of warm water. Scrub with a clean sponge. Rinse well with water. Washing soda is available at most grocery stores in the laundry products isle. Use a hand sander to roughen up the surface in preparation for painting. Sand enough to remove the outer gloss finish. Do not over-sand or you will have to do fiberglass repairing before painting. Rinse off the dust and dry. Wipe the surface with lacquer thinner and follow up by painting a layer of primer with a paintbrush. Allow recommended label drying time. Spray the aliphatic acrylic urethane paint with the high-volume, low-pressure paint sprayer. Apply three layers, lightly sanding between each layer. This will create a high-gloss finish. Allow the paint 48 hours to dry and re-caulk the edges using a caulking gun and a high-quality silicone caulk.